REQUIREMENTS: 500ml Spraying alcohol, 100ml Citronella essential oil, 5 15ml Pencil sprays, 5 100ml Spray bottles, Citronella stickers. METHOD: Combine all the citronella oil and spraying alcohol in a jug and stir through well. Decant it into pencil sprays and spray bottles. Your spray is now ready to be sprayed EVERYWHERE! On your body, on your clothes, on your linen, in the room, on the curtains and every place you think mosquitoes will be hiding. I even use this spray in my kitchen, on the counters, to keep away the ants. 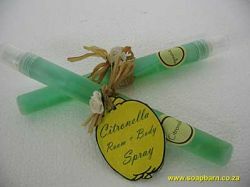 Citronella spray keeps away mosquitoes, flies, ants and all other uninvited guests in summer.